Creative people are 'right brain' people, while those who are more analytical tend to be 'left brain' people...or so it is thought. So if you are a 'righty' seeking other 'righties', then you are in the right place, becase we have quite a few sites focused on creativity and 'the arts' listed here. When onlline dating and social networking first made an appearance, there wasn't really much of a difference in the members. The first sites were mainly just large generic supermarkets of people. But now, the vast majority of online sites tend to focus on one thing or the other, like networking, or jobs, or even bringing together creative people. So, whether you are interested into music, painting, photography, modeling, dance, writing, or whatever...there is either a site specifically for you, or there is a section for you within a site focused on creative people. And when you think about it, that idea is so creative! Artist Dating is one of a few select sites that have been designed specifically for artists interested in meeting other artists. 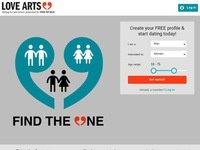 If you are interested in creative people, then Artist Dating is the site for you. Join for free to see if your artistic soulmate is here. Artist Passions is a free dating site for artistic singles. 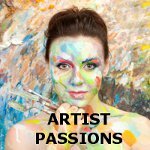 Whether you are a musician, sculptor, painter, designer, or you enjoy any number of other artistic endeavors, Artist Passions is the site for you. Join for free and take advantage of free email, chat, forums and more. Dating For Artists is part of a large network of niche dating sites built specifically to match members based on their interests. If you are artistic and you're looking for other creative individuals, then Dating For Artists just might be the site for you. Sign up now and see if this arts focused online site is the site for you! -Visual Arts - painting, drawing, sculpture, glass, digital, animation, etc. -Performing Arts - theater, music, dance, etc. -Literature - writers, poets, editors, etc. Here’s the ideal place to search for that special someone who will not only understand you, but will also fuel your imagination with their own creative spark." Looking for a site created for Arts Lovers? Love Arts is a site built specifically for anyone and everyone with a love of art. Join for free and find your artistic match. Creatives Dating is a site specifically for professional creatives to meet one another online. If you are creative and you are interested in other creative people, then this is the site for you. Join for free to see if you feel a creative spark. Social Network for artists, where they can display photos, profiles, etc., allowing interaction with other Pictify members via comments on the artists profile page. "The inside spot for art buzz and events." Artists can display their own work, post their openings, blog and more.